This guide provides basic information to help you start increasing dietary fiber in your diet. These are general guidelines that may be tailored to meet your needs. Fiber is an important dietary substance to help support your health. Making changes in your current eating habits will help you eat more healthfully. Most fiber-containing foods are also good sources of vitamins, minerals, and antioxidants, which offer many health benefits. A registered dietitian can provide in-depth nutrition education to help you develop a personal action plan. Lowers cholesterol-Soluble fiber has been shown to lower cholesterol by binding to bile (composed of cholesterol) and taking it out of the body. This may help reduce the risk of heart disease. Better regulates blood sugar levels-A high-fiber meal slows down the digestion of food into the intestines, which may help to keep blood sugars from rising rapidly. Weight control-A high-fiber diet may help keep you fuller longer, which prevents overeating and hunger between meals. May prevent intestinal cancer-Insoluble fiber increases the bulk and speed of food moving through the intestinal tract, which reduces time for harmful substances to build up. Constipation-Constipation can often be relieved by increasing the fiber or roughage in your diet. Fiber works to help regulate bowel movements by pulling water into the colon to produce softer, bulkier stools. This action helps to promote better regularity. Food labels are standardized by the U.S. government’s National Labeling and Education Act (NLEA). Nutrition labels and an ingredient list are required on most foods, so that you can make the best selection for a healthy lifestyle. Review the food label below. Determine the total amount of fiber in this product or ask your dietitian or health care provider to show you how to read food labels and apply the information to your personal needs. In order for a product to be labeled "high fiber," it must contain 5 grams or more of dietary fiber per serving. The recommendation is to consume about 20-35 grams of total fiber per day, with 10-15 grams from soluble fiber. This can be accomplished by choosing 6 ounces of grains (3 or more ounces from whole grains), 2½ cups of vegetables, and 2 cups of fruit per day (based on a 2,000 calorie/day pattern). Note: Eating a high-fiber diet may interfere with the absorption and effectiveness of some medications. Speak to your doctor about which medications to take with caution and when to take them. 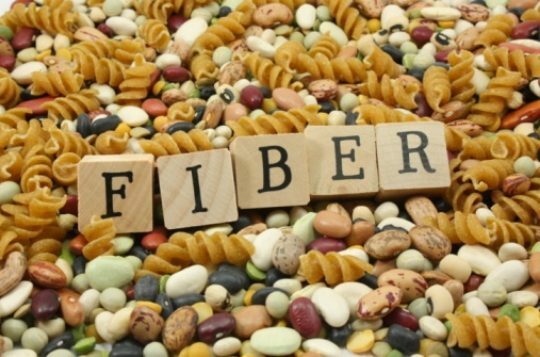 Fiber also binds with certain nutrients and carries them out of the body. To avoid this, aim for the recommended 20-35 grams of fiber per day. Some studies indicate that up to 50 grams of dietary fiber may help control blood sugars for people with diabetes. When eating a high-fiber diet, be sure to drink at least eight glasses of fluid each day. When adding fiber to your diet, be sure to increase fluids (at least 64 ounces per day) to prevent constipation. Buy bread with 2-4 grams of dietary fiber per slice. Buy cereals with at least 5 grams of dietary fiber per serving. Choose cereals with a whole grain such as whole wheat or whole grain rolled oats. Choose raw fruits and vegetables in place of juice. Try alternative fiber choices such as whole buckwheat, whole wheat couscous, quinoa, and bulgur. Try whole wheat bread and whole wheat pastas. Eat the skins of raw fruits and vegetables. Choose crackers with a whole grain listed as the first ingredient. Look for whole grain rye and wheat crackers. Drink at least 8 ounces of liquids with your supplement. Taking some fiber supplements without adequate liquids may cause the fiber to swell and may cause choking. Some fiber supplements to consider are Benefiber™ (hydrolyzed guar gum-soluble fiber), Metamucil™ (psyllium), Konsyl™ (psyllium), Citrucel™ (methylcellulose), Fibercon™ (calcium polycarbophil), and Fiberall™ (multiple sources of fiber). Psyllium husk and guar gum are soluble fibers.